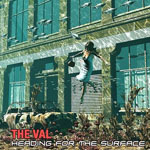 Share the post "Album review: THE VAL – Heading For The Surface"
Here’s a band who are genuinely thankful for the promotion of their debut album, judging by the massive list of media credits in this package. It is quite heart-warming when you receive a second album from an evidently promising “new” band, that you’ve nurtured through review or radio, and it actually exceeds all expectation. The Val is essentially Spain-based but vocalist Gabrielle de Val is German. That debut ‘Back’ (2011) hit the spot with our reviewer Pete Whalley even if he did think the AOR vibe was a little bit saccharine. Nothing has really changed for ‘Heading For The Surface’, although it’s still very well produced by guitarist Alfonso Samos. Again the lyrics are a little trite (for example on ‘Crusaders’ with its clumsy opening verse) but overall this is a collection of excellent pop-rock songs. At times, it could be Abba if they’d gone heavier (‘She’s Dumb And Blind’) or a lighter weight Heart (‘Wish You All The Best’). ‘Roses And Chains’ reminds me of Blackmore’s Night and Candice Night – in fact Gabrielle provides a similarly pleasant vocal throughout. If Gabrielle is very pleasing on the ears the band respond in kind, giving these tracks a very late-eighties sheen when hair was high on the agenda and a Desmond Child credit was de rigeur. This entry was posted in ALBUM REVIEWS, ALBUM REVIEWS (Mobile), All Posts and tagged album, AOR, Gabrielle de Val, Heading For The Surface, melodic rock, review, The Val. Bookmark the permalink.